Effective propaganda almost always works below the level of consciousness, leaving its target feeling a powerful urge or belief that s/he "knows" is true; a position that s/he is certain was arrived at completely on his/her own. It is also true that it does not exist in a vacuum. Much of its effectiveness comes through constant repetition, including appearances in many different forms throughout one's environment. Because of this, reasoned argument has almost no effect in countering it. However, equally competent counter propaganda might. Below are 4 posters. One from World War I, one from World War II and two from the Vietnam era. All four still radiate power. Just imagine how that power must have been magnified as it boomed through people's daily lives from the various media of their day. 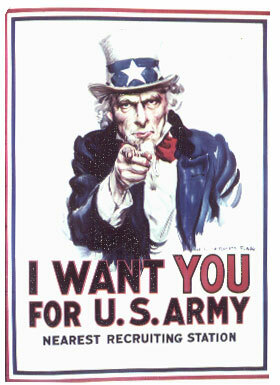 Indeed, the Uncle Sam image created by James Montgomery Flagg* for use by government recruiters in 1917, and resurrected for World War II twenty five years later, became one of the most potent symbols in U.S. history. It is as effective today as when it first emerged from the tip of Flagg's pen. As the American anti-war movement developed strength during the Vietnam era, skilled propagandists were drawn to practice on its behalf. Thanks to that fact, we have powerful, skillfully created anti-war images to juxtapose with Flagg's pro-war ones. Here is how to put them to work with your students. If you have not yet done so, introduce your students to the idea that it is possible to read messages from images. The processes used in Cartoonist for a Day and Why People Smoke are good ways to do this. Print a copy of the 1917 Flagg poster for each student, or prepare a slide that can be shown to the entire group. To print the poster's image, click on it. It will open in a new browser window. Use your browser's print command to print it from there; then close the standalone window, being careful not to exit your browser program. Distribute the copies or display the slide. Lead a discussion where your students attempt to achieve a consensus on its basic message. To me it says that a strong, resolved nation (represented by a stern, sober, focused Uncle Sam) needs your help to remain strong; but remain strong it will. Once you've decided on the message, discuss how the artist conveys it. Discuss the colors used, the flag motif, Uncle Sam's expression and his piercing eyes. Once you feel your class has a fairly solid understanding of the poster, and its pro-war perspective, discuss with them what a poster arguing against war might look like. What images, colors, etc. might an artist use to create a simple message, and what might that message be? After they've settled on an approach, you might want to see if anybody (or anybodies) wants to actually attempt a drawing. If so, see what they can come up with, then discuss the results. Does it have the same power and simplicity as Flagg's poster? Distribute copies of, or display, the 1972 poster. 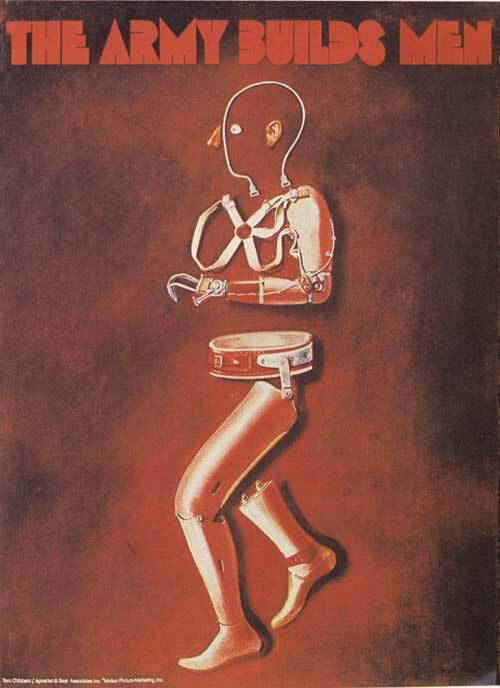 Lead a discussion where you identify the artist's message, then explore how s/he was able to use so many of the elements Flagg used, yet project an exactly opposite message. You might especially want to explore the use of darker, earthier colors to emphasize the death motif. In the end, instead of a strong nation beckoning, death's bony finger calls, hiding behind Flagg's resolute mask. Even the skeleton's head is positioned exactly to match Uncle's. Notice that the eye Flagg drew remains, covering the exact spot where the skull's left eye socket would otherwise appear. If you want, distribute (or display) and discuss the second pair of posters. 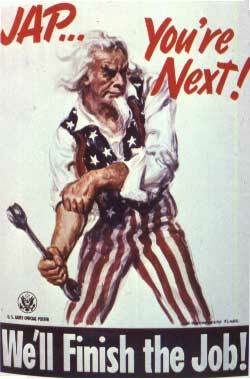 Notice the racist language in Flagg's 1944 poster. Point out that war propagandists almost always demonize/dehumanize the enemy. It is necessary in order to get ordinary people to kill, and to support killing in their name. Of course, once the war is over, the formerly demonized people can be rehabilitated, and sometimes develop into close allies. (George Orwell wrote about this process in 1984.) Go on to discuss how Gibbs manages to take another recruiting slogan and turn it on its head, making it mean the opposite of what it has in other hands. You can extend this activity using poster pairs that show Faces of the Enemy as well as the posters used to illustrate American propaganda from the 2003 war against Iraq. You can also extend it with the work of Micah Wright, a clever artist who has taken propaganda posters from World Wars One and Two, and converted them into contemporary antiwar posters. Take one of his posters, and either find an original yourself (available at one or more of the sources below) or assign a student to do so. Use it and the corresponding Wright modification as described in steps 2-9 above. If you want to see more war posters, look at the online collections you'll find at the sites for the Northwestern University Library and the U.S. National Archives. Georgetown University has put up a set of World War I posters. The Cleveland Public Library also has a nice collection. For an international perspective on WWI posters, look here. Earthstation1.com has also posted an exceptional collection of U.S. posters from World Wars I and II. To keep current with the contents of the ever-changing web, look at this Google search periodically. You can also use this link to visit Amazon.com's search page. If you type "war posters" (without the quotes) in the subject box, then click the Search Now button, you'll see a list of all the war poster books currently available through this site. You can also use this link, to get a similar list from the Barnes and Noble site. 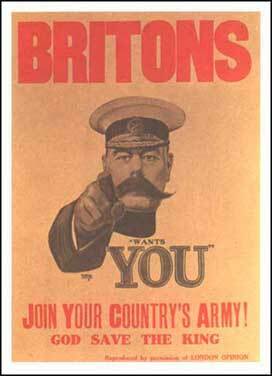 Apparently James Montgomery Flagg got the idea for his I Want You poster from Alfred Leete's 1914 British recruiting poster featuring Lord Kitchener (shown below), which by 1917 had shown itself to be exceptionally effective in Great Briton. What do you think? 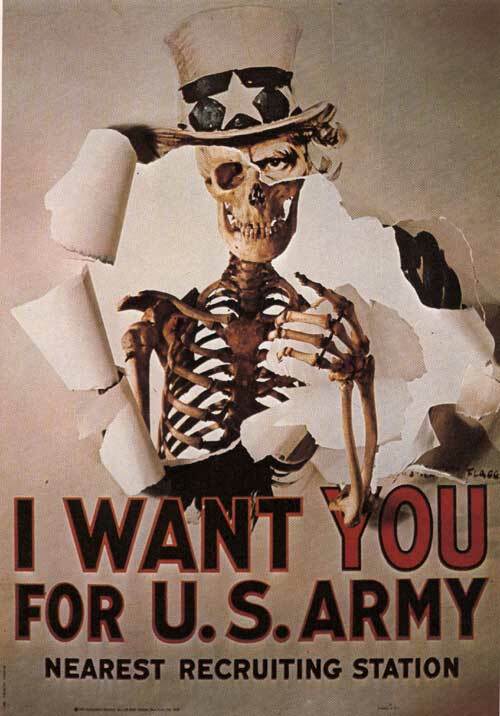 For more on the history of Uncle Sam and the James Montgomery Flagg poster, see the Wikipedia page at http://en.wikipedia.org/wiki/Uncle_Sam.